New leak reveals sturdy tablet from Motorola, but could be a long ways off. The next tablet from Motorola could be more than just a specifications and software upgrade from the current Xoom model. According to Engadget rumors, the American telecommunications company is gearing up for a yet-to-be-named rugged enterprise tablet release. The supposedly leaked key features table of the 7-inch tablet points out some of its abilities to withstand environmental stress and shocks. These include 4-foot drops onto plywood, temperatures of up to 50 degrees C (122 degrees F), and IP54 sealing for dust protection and mild waterproofing. Besides being able to withstand bumps and bruises, the unnamed potential tablet may still feature some impressive specs. The screen should provide a bright 1024x600 resolution display with its dual-core 1GHz TI OMAP4 processor, 1GB RAM, front and rear cameras, and an 8GB SSD. The common connectivity options such as USB, HDMI-out, Bluetooth 2.1, and 802.11n should all be included as well, for a total battery life of up to 5.5 hours. 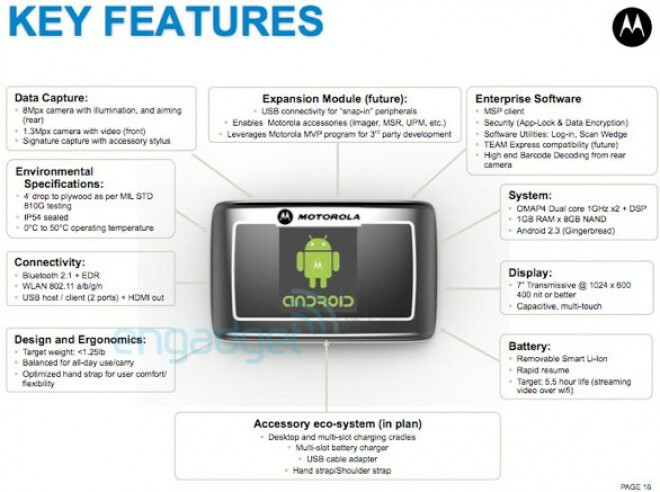 On the software side, the device is expected to ship with Android 2.3 if released. Whether or not it would be upgradeable to the more tablet-efficient Android 3.0 is currently unknown. Prices and release dates for the sturdy business-oriented tablet are still a mystery, but Engadget claims it has yet to even enter beta testing, a phase supposedly scheduled to begin this October. Therefore, it could be quite a while before Motorola makes any public announcements regarding the rumored tablet, but we’ll definitely keep our ears open for additional info.